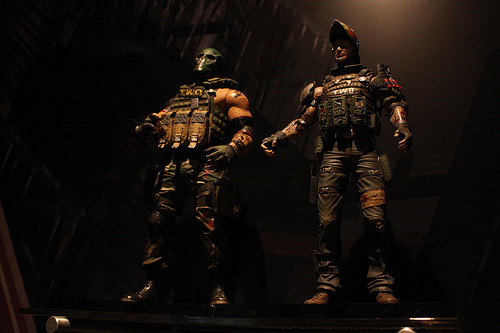 We aren't really sure if these Army of Two action figures from Neca Toys will have actual "fist bump action" - but we'll keep our fingers crossed. The official Army of Two Twitter feed has revealed these upcoming licensed toys, and from the prototype shot above, they look pretty detailed. There's no further information available yet, but you can bet these will be released around the same time as the upcoming sequel. Page created in 0.3740 seconds.